It’s easier than ever to purchase a professional drum set, and there are more options now than ever before. As with so many other things, no two drum kits are created equal. The good news is that even some inexpensive options can be upgraded later, so you can get a decent setup even if you’re on a fairly tight budget. Choosing a drum kit can be a nerve-wracking experience, particularly when you start reading different opinions. It’s important to remember thatas with other consumer goods, there’s no such thing as the best professional drum set for each and every situation. What works well for one individual may not even be close to ideal for the next!Knowing what’s important can help you weed through the clutter and come up with a clear idea of what it is you really want. Complete drum set or shell pack –These terms can help you understand what you’re getting. A complete drum set includes stands, and it often includes cymbals. Some manufacturers add extras, which can help you get started. A shell pack includes just the drums – usually a snare drum, a bass drum, a floor tom, and a rack tom or two. Acoustic or electronic – Most drummers opt for acoustic drum kits, but electronic drum sets offer some advantages, particularly if you’d like to practice in your home or apartment without disturbing anyone nearby, or if you’re very tight on space. Number of pieces –The number of pieces includes the drums themselves, along with any stands, cymbals, hardware, etc. Choose a set with a low number if you want to pick out certain components yourself, i.e. you want a specific brand/size high hat and/or cymbal setup. If you’re a complete beginner, then you might find it more convenient to go with a larger kit and replace certain items as you develop your own playing style. Rock/standard – larger drums with louder voices, versatile enough for rock, country, metal, etc. 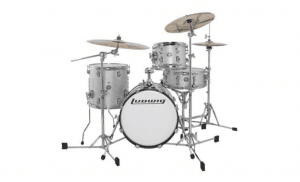 Bass –Does the kit come with one or two bass drums? A few kits come with a double bass setup that’s ideal for playing metal. Most players – especially beginners – favor a single bass setup. With these considerations and a few other important details in mind, we’ve shortlisted five of the best professional drum sets on the market. The Alesis Nitro electronic mesh drum set features eight pieces: One 8” dual-zone snare pad, three 8” tom pads, a ride cymbal, a hi-hat cymcal, and a crash cymbal with choke. A hi-hat pedal, an 8” kick drum, and a corresponding kick drum pedal are included. A four-post collapsible aluminum rack keeps the setup together, and breaks down easily for storage. 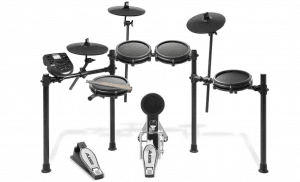 The set includes a Nitro Module with a sequencer, metronome, and recorder, plus 60 pre-recorded play-along tracks and a CD/MP3 aux input to allow drummers to play along to any song. Connection cables, a drum key, a power supply and all essential connection cables are included, along with a pair of drum sticks. The mesh drum heads offer a natural feel. Add headphones for quiet yet energetic practice sessions, or transmit the MIDI information to your computer for endless creative potential. A little short for very tall players; one reviewer remedied the situation by adding bed risers under the frame. Beginners and more experienced drummers who want to improve their performance. This drum kit is inexpensive, so it’s also a great choice for someone who is on a tight budget, and who isn’t tied down to the idea of an acoustic drum set.It really shines in environments where a standard drum kit is too large or too loud to play – with headphones on, listeners will just hear tapping sounds as your sticks hit the mesh. This drum set is a lot of fun. It’s the ideal tool for enhancing your skills as a drummer, whether you’re brand new to the art form or if you’ve been laying down beats for decades. 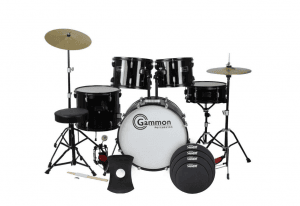 This Gammon Percussion full size complete drum set bundle features a five piecewood shell set with a single bass, a floor tom, two mounted toms, and a snare, all finished in glossy black or blue. Hi-hat andride cymbals are included, along with drum stands, cymbal stands, a pair of drum sticks,a drum key, and a basic drum throne. Chain-driven hi-hat and bass drum pedals come with the set.Additionally, the bundle includes SoundOff by Evans drum mutes and a SoundOff by Evans hi-hat mute for quieter practice sessions. This drum set is also available without added accessories. Beginners on a budget, or people who are revisiting the idea of playing the drums after a hiatus. While it’s not a toy, it’s also not a high-end drum kit. This drum set gets excellent marks for home practice situations, with users ranging in age from pre-teen to senior citizen. While the pedals, cymbals, heads, and drum throne are stock, they can easily be upgraded as your budget allows. The Ludwig Breakbeats 4-Piece Shell pack includes a single 16” bass kick drum, a 10” rack tom, a 14” floor tom, and a 14” snare, all finished in white sparkle. Each drum is fitted with a Remo Pinstripe head for high-quality tone right out of the box. A bass drum riser is included, along with bags for transporting and muting. Drummers who play small venues, as well as any drummer on a fairly tight budget. If you’re hoping to build a great drum kit for use in smaller clubs, at church, or for practicing at home, you may want to give this one a look. Keep in mind, it’s a shell kit only, so you’ll have to choose your own cymbals, drum throne, bass drum pedal, etc; at the same time, Ludwig offers excellent quality at a good price. This kit represents a good opportunity to get exactly what you want without spending a lot of money all at once. 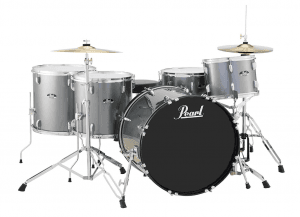 The Pearl Roadshow 5-piece drum set includes two floor toms, a rack tom, a snare, and a kick bass, all beautifully finished in your choice of charcoal metallic, wine red, black, or bronze. The snare features a 9-ply poplar shell for enhanced tone. While this is marketed as a shell kit, it comes with a few nice extras including a 16” crash ride cymbal, 14” hi-hat cymbals, drum and cymbal stands, Pearl’s standard chain-drive bass drum pedal, and a double-braced drum throne. This Pearl drum set is also available as a four-piece jazz kit or as a five-piece new fusion kit. Beginning, intermediate, and experienced drummers. This drum set isn’t a top of the line kit; however, it is great for practicing and players will find that it can “grow up” alongside them. Once heads and cymbals have been upgraded, it’s also a nice set for playing in front of an audience. It’s worth noting that most people are happy with the Roadshow drum set overall, but many opt to replace the throne for something a bit more comfortable. 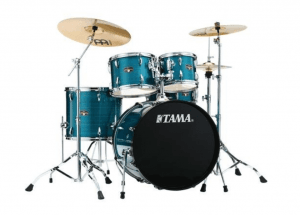 The Tama New Imperialstar Complete Drum Kit features a five-piece shell pack in poplar, all with Tama’s signature wraps in an appealing hairline blue finish. A floor tom, a snare, two rack toms, and a kick bass drum make up the kit’s core. Meinl HCS cymbals are included: The kit comes with a 14” hi-hat, a 20” ride, and a 16” crash cymbal. Additionally, this set include a Tama HP200P bass drum pedal, double-braced drum and cymbal stands, and a height-adjustable drum throne. Drummers who want an upgrade at a moderate price. While Tama’s New Imperialstar comes at a price well under $1,000, it manages to deliver a pleasing performance as soon as it’s set up. All components are of good quality. Note that this set doesn’t include drum sticks. If you’re brand new to drumming, you’ll need to pick those up separately. As you get closer to deciding which professional drum set is best-suited to your needs, there are just a few more things to keep in mind. Drum heads: Some professional drum sets come complete with good-quality drum heads, while others leave it up to the buyer to purchase drum heads separately. It’s worth noting that the drum heads that typically come with kits are OK for practicing, particularly if you’re a new drummer, but not at all ideal. This is one important upgrade that you’ll want to keep in mind later on, as premium drum heads are far superior to factory heads that normally come standard. Throne sold separately: A few drum kits come with a throne (seat) but many do not. The reason for this is simple: Drum thrones come in different sizes and configurations to suit individual needs. Better bass drum pedals: Your chosen drum kit may or may not come with a bass drum pedal. This is another component that you’ll probably want to upgrade in the future, since factory drum pedals lack some of the features found in high-quality units.Don’t let the lack of a pedal keep you from getting the kit you really want! Price:Once you begin researching, you’ll find that drum prices vary greatly by brand, as well as by what’s included with the kit.Be suspicious of anything that sounds terribly cheap, unless it’s on sale (maybe due to being discontinued by the manufacturer, for example). Watch out also for drum kits over about $1,000. Any higher than that, and you’re probably better off building your own set with components that meet your exact specifications. Whatever your budget, it’s fairly easy to find the best professional drum set for your desired playing style. Our advice is to get what works for you now, so that you’ll be happy with your purchase. Drums are more of a commitment than smaller items, so go for quality over quantity if needed. You can always add more components later and eventually, you’ll be playing the drum set of your dreams.